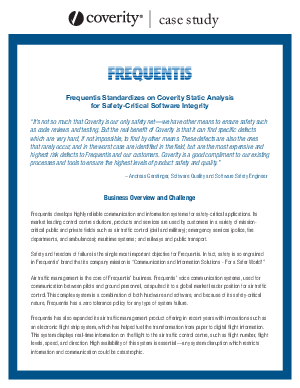 White Paper Published By: Coverity, Inc.
Frequentis develops highly reliable communication and information systems for safety-critical applications. Its market leading control centre solutions, products and services are used by customers in a variety of mission critical public and private fields such as air traffic control (civil and military); emergency services (police, fire departments, and ambulances); maritime systems; and railways and public transport. Safety and freedom of failure is the single most important objective for Frequentis. Frequentis’ mission and commitment to safety is engrained into every part of the company, and the software quality organization is a direct reflection of this commitment. Coverity has helped Frequentis ensure a high level of software integrity to support its product mission of freedom from failure, while continually improving the productivity of its developers.